Protesters from the yellow vest movement took to the streets of France on Saturday for a 21st straight weekend, with thousands marching across Paris and a group briefly invading the busy beltway around the capital. Security forces announced 32 protestors had been arrested so far, and 21 who defied the ban on the Champs-Elysees were fined. Two people were slightly injured during tensions with the police in demonstration away from Avignon's city center. Eight protestors were arrested in Montpellier, while two police officers were injured. Three others, including two police officers, were also injured in Toulouse. According to the Interior Ministry figures, 33,700 protestors, including 4,000 in Paris, took place in nationwide demonstrations on Saturday. "We will continue until victory. We give up nothing, because today, nothing has been obtained," Agnes Berger, a protester from Saint Cloud, west of Paris, said. "We still have a corrupt system, an elite that governs against the people." The number of people taking part in the yellow vest demonstrations has been dwindling since the first protests over fuel hikes in mid-November attracted hundreds of thousands turned out. But the leaderless grassroots movement for social and economic justice continues to pose a challenge for French President Emmanuel Macron. Macron organized a national debate to respond to concerns about sinking living standards, stagnant wages and high unemployment that were aired at the demonstrations. Prime Minister Edouard Philippe is set to provide an initial recap Monday of the debate, then to address parliament. Any proposals growing out of the numerous meetings that made up the initiatives were expected later. Many yellow vest participants remain skeptical. Jeremy Gibon, from the suburb of Le Mesnil-Amelot, underscored protesters' determination with his call Saturday for a radical solution that creates a "new system." "It's a war of attrition," Gibon said. "We feel if we make everything fall, we can rebuild something.... It will be for us. You'll see." The movement got its name because protesters wore the fluorescent safety vests motorists are required to carry in France from the start. The vests symbolized frustration over fuel tax increases Macron ordered as a disincentive to drivers, an action intended to curb climate change. The movement's demands since have multiplied to include a people's referendum and the restoration of a wealth tax, with increasing the buying power of the majority of France's people a bottom line. Like protesters' demands, police tactics for maintaining order during the weekly protests have evolved. Paris police fine-tuned their strategy to make officers more mobile and more proactive in countering danger and destruction. A new police chief was appointed. Last month, rioters set life-threatening fires, ransacked luxury stores and attacked police around Champs-Elysees Avenue, the street famous for its beauty and high-end shops. The Champs-Elysees has since been declared off-limits to protesters. One prominent figure in the movement, Eric Drouet, was among a half-dozen protesters seen in the prohibited area and issued a fine he plans to contest, Drouet's lawyer, Kheops Lara, told French television channel LCI. 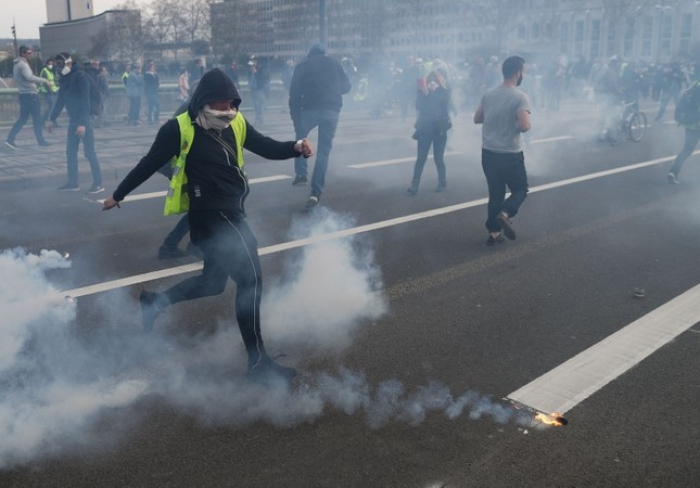 In Paris, one of the two marches on Saturday went from the Place de la Republique in the east to the business district, La Defense, on the capital's western edge. The finishing point was chosen because of its significance in the world of finance, Drouet said. The yellow vest movement "hasn't stopped at all," Drouet told LCI. Meanwhile, France's Constitutional Council vetoed Thursday a measure backed by Macron's government to prevent violence during protests. The law was not proposed as an outgrowth of the yellow vest protests. The Constitutional Council struck down provisions authorizing regional prefects to ban people from demonstrations if they were seen as a serious threat to public order. The council ruled that would give authorities "excessive latitude" and infringe on freedom of expression. But it approved other parts of the law — not yet in force. One broadens the circumstances under which police can search protesters' bags and vehicles. The other makes it a crime for protesters to conceal their faces, with convictions punishable by up to one year in prison and a 15,000-euro ($17,000) fine. Yellow Vest protests cost €200 million ($225 million) in damages so far, according to figures shared by the French government.